You all know I love my hair products, and am usually loyal to the ones I know and love. But I'm always happy to buy new additions for the family. Due to a week of hot sun, humidity and being seperated from my heat protector sprays, I had worse split ends than Worzel Gummidge (remember my hair is bleached too, under the red)! I was definately due a haircut. Usually, after my cut, I have my hair blowdried in quite a sleek way - but I asked my stylist (Shout-out to Chris who always keeps me from looking like a hot mess) to add more volume to my fresh, chunky layers. Oh yes. THAT'S a volumizer. It's completely different to a mousse or volumizer spray. It's DUST! All you have to do is shake it up, sprinkle a little onto your roots, rub it in, scrunch and watch your hair expand! It's really cool when you shake it up, the dust fills up the whole bottle, then slowly settles again. I thought at first it was going to be the same consistancy of dry shampoo, which I have never really liked. My hair always feels weighed down and limp. But the texture is very light, and slightly grainy, like very very fine salt. But it doesn't leave any residue in my hair. The dust does work best if you like that big messy hair look, like I do. It's especially brilliant if you have a lot of layers as it can really give them a kick. But if you like neat, chic hair with that extra oomph, it may be best to give this one a miss as it gives a bit of a bed-head look. The only downside is that you can really 'feel' this working in your hair. Personally I like that matte feeling of texture, but it really grosses some people out. What I like best is the fact that with this, I'm able to eliminate several harmful processes to my hair. Such as to get the same look I've had to add a volumizer, blow dry the opposite direction to my hair growth, pile on the hairspray and backcomb. My hair is crying out in pain, I tell thee! With this, I just have one easy process - sprinkle and scrunch! No backcombing or hairspray needed. My hair has never looked this decent at 11pm after snugging under my duvet for a few hours with series 5 of Buffy The Vampire Slayer (God, I could never stand Dawn!). 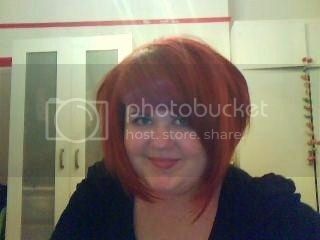 And if my hair got limp throughout the day, I just gave it a bit of a scrunch and joozjh - and it was massive again! You can buy Label. M at all Toni & Guy salons or there's plenty of places online if you do a quick search. Label. 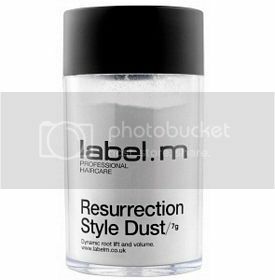 M Resurrection Dust costs £10 for 3g and about £15 for the 7g (which I got). Have you ever tried a product that was a bit off-the-wall? NOTE: I paid for this product with my own money, and all opinions are my own. I was given no compensation for writing this review. Wow, that's some impressive product! I don't think I'm brave enough for such big hair but yours looks fantastic. Dawn is ridiculously annoying. Michelle Tratchenberg was actually really good in Mysterious Skin however. That product sounds amazing. I have no idea where in Australia you could find such a thing but I'm going to hunt it. I <3 fake messy bed hair. haaaaaaaaaaaaaaaated dawn! i love buffy though! i need that sprinle dust thing! so bad! Wow that looks amazing! My mum kept going on about some dust that the hairdresser had sprinkled in her hair and I thought she'd gone a bit mad haha sorry, mum! I always hated Dawn - and I hate her character in Gossip Girl, too, ha! Wow, that is some volumised hair! Impressive. I always hated Dawn too, and the stupid storyline that came with her. I need that one. I can't stand mousses when it's summer since they feel too icky. Your hair looks amazing. I'm way too lazy to do anything to mine since they're a stubborn bastards. Tamara: Yeah I heard about that - but I can never find any Swartzkoft products except hair dye and sometimes shampoo/conditioner. Lillian Funny Face: I know I always felt like they introduced her as they were running out of ideas - it just got silly by the end, though The Gift is a lovely, sad episode. I love your blog so much that I will start follow you! Wow, that does look amazing! I may have to try that, I do have very thick hair anyway, but it tends to always have all the volume at the ends rather than the roots. Eeek, that REALLY looks cool! I think I might use one of these thingies because my hair are rather flat all the time :/ I just love the 'after 10 hours' picture! is your toni and guy salon in gateshead? because i had a trainee called chris do my hair at the toni and guy training place in manchester last summer, and he was really good. and i think he worked in gateshead i'm not 100% sure though. aroselikethis - yes i was at the academy last year end of july, right through august and end of september! i work at the newcastle salon :) it really is a small world!